Using a Wi-Fi connection for voice calls is not a new idea , as we’re currently enjoying the Truphone app on the iPod Touch and the specially created Skype phones from 3 . This is the first time T-Mobile have chosen to dip their toes into this treacherous pool, and they’ve done so by updating their Shadow handset. They’ve given it UMA support, which means it will now be capable of using a Wi-Fi signal. This allows you to make unlimited calls over Wi-Fi networks, moving away from the standard cellular network. This could potentially mean incredibly cheap calls (or huge internet charges), but it’s a very exciting premise. So how will it really work? They say that you’ll get unlimited free Wi-Fi calls at any T-Mobile hotspot as well as free calls when in signal from your wireless provider. This will clearly mean that piggybacking your neighbours signal will suddenly become more of an issue, but it could also mean that your monthly charges are a lot lower. The Shadow runs on Windows Mobile 6.1 and has a slide out QWERTY keyboard. The screen clocks in at 1.6 inches, which is fine for a casual user, but Smartphone addicts may want to look elsewhere. 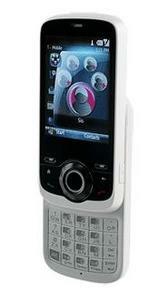 It also includes a 2 megapixel camera and a rather nifty scrolling navigation wheel on the front. It features a USB 2.0 connection for easy data transfer with ActiveSync, and is available in two new shades, white mint and black burgundy. The handset is made by HTC so you have their proprietary jack issue to worry about, which is annoying. Then again, as it’s only available in the States, we don’t really have to worry to much. it could also mean that your monthly charges are a lot lower.